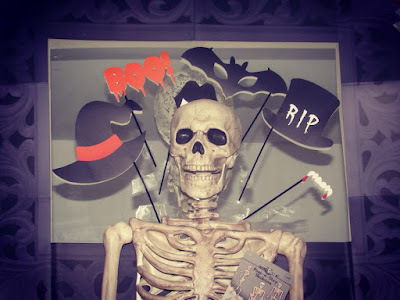 It's that time of year again, when those of us who choose to celebrate Halloween start to plan the event! I've got some brilliant idea's to show off to you all, but for now, I've got to show off some of the shop purchased products! We'll leave the DIY bits for later, and get the exciting post out of the way! 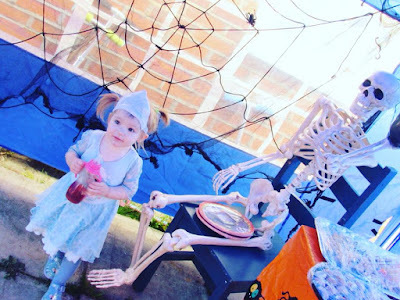 This year Matalan have a large range of products on sale, and I was fortunate enough to get my hands on some of their buys, including an exclusive web only sale skeleton, who I've decided to call Jack! 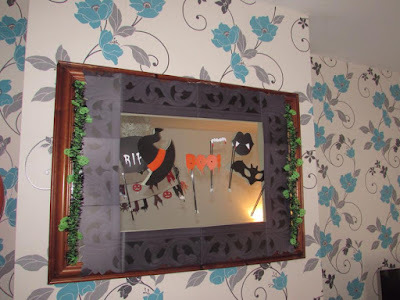 When you're quite the Halloween fan, like me, and you're given a budget, it's an impossible task of selecting what to buy, especially when the range is so good! However, I narrowed my choices down and managed to get all of the following for £70! Although this would cost you quite a fortune if you purchased a number of these to give out to trick or treaters, they wouldn't cost that much if you had a small Halloween party, or purchased one or a few for your children! I've put Spud's to the side for the actual 31st, where I am planning on giving him a little Halloween hamper as I don't like him doing trick or treating. This witch is full of the colours we associate with Halloween (green, black, orange, purple and red! 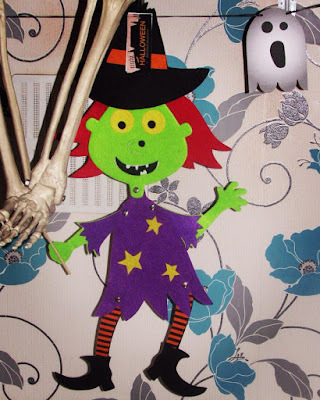 ), for just £2 she is a perfect decoration for any house throwing a Halloween party or answering the door this year! The witch is made of felt, and isn't scary looking at all! 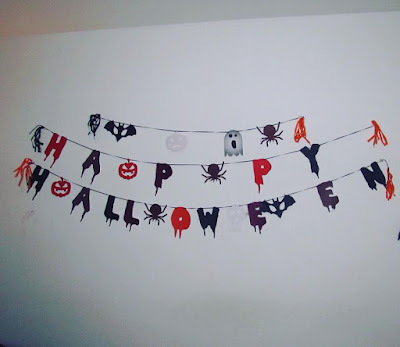 For just two hundred pennies, which isn't an awful lot at all, your walls can display this marvelous Happy Halloween bunting! 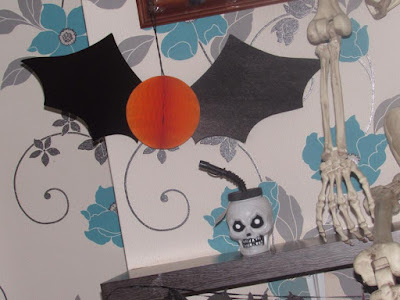 Consisting of three different rows of Halloween bunting - a short bunting with Halloween inspired tissue paper (orange and black), a bat, a pumpkin, a ghost and a spider! 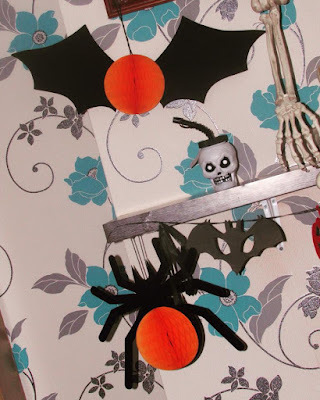 There's also Happy, also containing Halloween coloured tissue paper at either end, with a pumpkin and a spider, and finally we have Halloween, again with the Halloween tissue paper, a pumpkin and a bat. I love that they're separated from each other, so you don't have to place them all in the same place, if you wish not to! Honeycomb Bats and Spiders x4 - £3. If you know me, then you'll know I'll never allow a spider to remain in my house, not even a toy one, but there's something about these honeycomb decorations that make these spider's look cute! Yes I just said a spider looks cute! You could make real life spiders pink, and glittery and I'd still freak out at the sight of them! In the pack, you receive two bats, and two spiders! Setting them up is easy, pull of the tabs, protecting the sticky tape, and voila, your decorations are ready to show off! This product was the first to go in my basket when I purchased it, there's something about photo booths that I love! Although it's not one of the fancy ones you'll find at someones wedding, it is DIY, it's fun, and it cost only four pounds! Inside the box, you'll find the frame, along with six props, on sticks; RIP top hat, witches hat, Boo, vampire teeth, lips and a bat mask! Again this is something you wouldn't want to purchase too many of due to the price, however, if you have one child, or even a few, then a couple wouldn't break the bank! 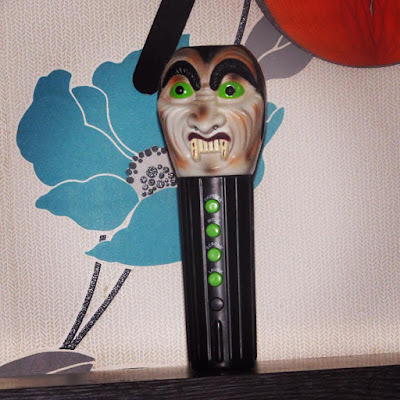 It's the most perfect and cool Halloween toy for children, it can also be used as an accessory on Halloween too, to accompany costumes! There's a variety to purchase including a pumpkin, skeleton and alien. With a great range of costumes, not just for children but for adults as well, it was hard to choose a costume for Spud without having his opinion as he was at school! 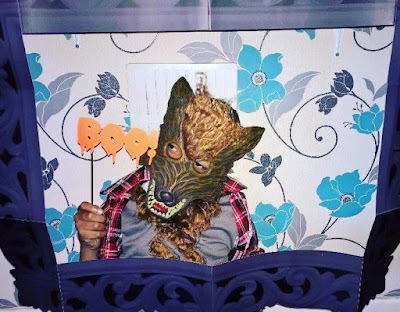 However, I went with the werewolf costume and was pleased I did so, as not only did Spud love it, but the costume also come with werewolf hands (gloves! ), which is what a lot of costumes fail to supply! The mask, shirt and gloves all have fur on to give the ultimate spook effect, with the trousers being cropped plain black! 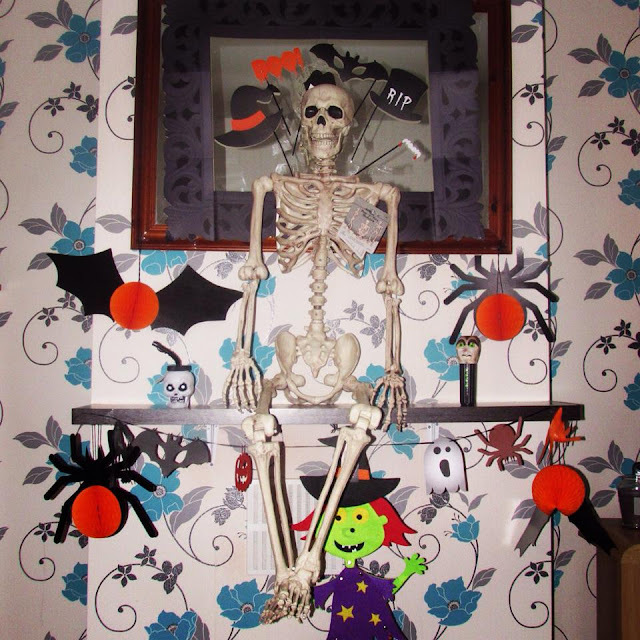 Full Size Skeleton - £40 (on offer: 3 for 2). Last, but indeed not least is Jack, Matalan's didn't call him Jack, but I did! Jack is an exclusive online purchase, but we didn't mind because he's just so brilliant! Some hanging skeletons come across as rather spooky, however Jack is not spooky at all, his biggest fan was the youngest guest of the press party, she wanted to take poor Jack home with her, but he was too heavy for her to drag along! With the right care and attention, Jack can be a lifetime friend, or Halloween decoration, he has posable joints, and isn't that scary at all! To check out the Halloween range yourself, pop down to your nearest store, or have a look online at the Matalan Halloween Shop.